The serger is a very helpful companion for your sewing machine that will help bring your sewing to a whole new level. Sergers produce nice clean seams like those found on most store bought clothes, help reduce puckering and stretching on more fiddly fabrics like knits, and create different decorative stitches. Instead of using a needle and bobbin like a sewing machine, the serger, also known as an overlock machine, makes stitches with needles and loopers while a knife cuts away the excess fabric. It does all this at a fast rate, which makes sewing a professional seam a quick and easy one-step process. In this section I am going to cover the stitches you will utilize on your serger most often. The most common serger stitch is the 3-thread overlock. This stitch uses one needle, which holds in place two looper threads. This stitch has a bit of stretch, which makes it a great stitch for knits. If you add another needle then you get the 4-thread overlock, which works well with wovens and makes a sturdy stitch that is good for clothing and home dec projects. The rolled hem is probably the most common decorative stitch used on a serger, and can be made using two or three threads. It is a great way to finish napkins, ruffles, scarves, and other edges. You can even use decorative thread to give it that extra pizzazz. A flatlock stitch is a variation of the 3-thread overlock. The flatlock stitch joins two separate pieces of fabric in a flat seam, leaving no bulk. You usually see the stitching made by a flatlock, so it is often used decoratively as well. More expensive sergers also have the capability to do a 5-thread safety stitch and a coverstitch. The safety stitch is a very sturdy stitch that combines a chain stitch and a 3- thread overlock stitch. You often see the coverstitch on your t-shirts. No blade is used and the two needles sew two parallel lines on the top, while the loopers form a braided pattern on the underside. You can also purchase a separate coverstitch/chainstitch machine for making this stitch if your serger doesn’t have this function. Some people prefer owning a separate coverstitch machine because on a combination machine the knife has to be disengaged making it difficult to switch back and forth between the coverstitch and the other stitches. Most sergers today also have differential feed, which can help with sewing knits and creating ruffles. 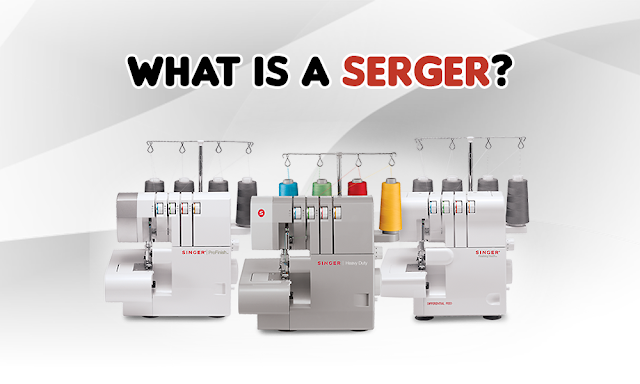 The serger feeds the fabric from both the top and the bottom. So when you are sewing a regular woven edge you will usually keep the feed the same. However, with knits you can adjust the feed so that the fabric feeds through at a different rate so that your seams don’t stretch. You can also use the differential feed to create gathers, ruffles, and lettuce edges. 1. Threading Ease: This is often the most common complaint about sergers. However, it doesn’t have to be if you do your homework. Make sure your dealer goes through threading the machine with you before purchasing. However, if you do not have a dealer, most sergers are color-coded to help you through the process and come with helpful manuals and videos. 2. Tension Adjustment: Because there are 4 or 5 threads in a serger there are also just as many adjustments to make to the tension. Basic machines make you do this manually, but don’t worry: most come with a guide for adjusting the tension for different stitches and fabrics. More expensive sergers even adjust the tension automatically or have it pre-programmed. 3. How easy it is to convert to a rolled hem? Some machines require you to change the throat plate making it more difficult. 4. Does it have a free arm? A free arm helps sewing small areas like sleeves. 5. What kind of needles does it use? Some sergers require special needles while others can also use regular sewing machine needles. 6. What kind of attachments does it come with? There are several different types of feet for sergers that can help with different techniques like gathering, blind hems, piping, beading, and elastic and tape. So, if you are looking for new sewing adventures consider looking into a serger! A serger doesn’t just have to be just for advanced sewers. It can be a very helpful tool for sewers at all levels. It can help speed up your sewing and give your projects a more professional look.